Oh so sorry, blog followers! I neglected to post a final thank you for all of your prayers and encouragement throughout this Africa2017 journey! The team is home and readjusting to life as we know it. But we are not the same. What the Lord allowed us to see and experience will be forever seared into our hearts and we will never ever be the same. Thank you for your prayers. We did what God sent us to do - equip, train, impart and minister His grace and His truth to those in our path. Now we pray that whatever seeds were planted, God will grow in His perfect timing. 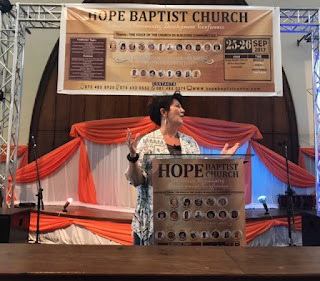 We saw the lost saved, the saved encouraged, edified and equipped, and His name lifted high throughout the Christian Community Conference, Eye Glass Clinic, and other ministry opportunities. Julius and Cintia and their faithful staff at Hope Baptist Church are serving with integrity and honor in Sunnyside. The Lord is bringing in the harvest through their obedience to His call. Please continue in your prayers for all of them. We had a fabulous time yesterday serving the people of Soshanguve with a traditional African braai. 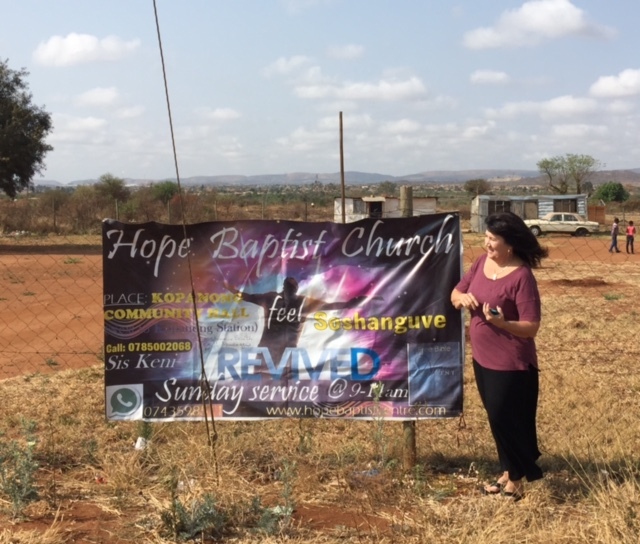 The first few snaps are of our team either shopping or meeting up at Hope Baptist. The remainder are a few samples of the precious people God has seared into our hearts from the Soshanguve community. Today, Pastor Keith will be preaching out at Soshanguve while Steve Shook is giving the word in a sermon at the main campus of Hope Baptist. Thank you for your prayers. This has been a powerful time as the Lord has faithfully connected hearts in Him. To God alone be the glory. The eye glasses clinic on Thursday was an amazing time of listening and sharing and making new friends. What a privilege it is to be an instrument to introduce people to our Jesus. Please pray that the seeds planted germinate and grow to full fruition in Christ. Our God longs for the lost to know Him and the saved to walk deeper with Him. Your prayers are crucial as we continue to share the truth of Jesus with those He brings across our path. Pray today (Saturday) for our outreach at Soshanguve. We are putting on a huge neighborhood braai (BBQ) so Pastor Keith is in his element! Here are some snaps throughout the week - Mona and Becky leading a workshop. Some pictures of the beautiful brothers and sisters in Christ who are doing the faithful gospel work here. A picture of two young girls who helped lead us in worship throughout the conference. Mona teaching in the general session. More pictures to follow. Pictures will follow separately as the internet here is slow and spotty. Continue to pray for the people of Hope Baptist, Sunnyside and all of South Africa even when you don't hear from us. The time change and internet connections make things a bit trickier than usual. The Christian Community Development Conference was amazing! Everyone on the team presented on different subjects and the reception of the attendees was encouraging. We trust that God is using our offerings to further His kingdom here in SA. Our team is grateful for your prayers as each of us felt the peace of Christ in our midst. Pray for all those who attended to take and implement the truths which God imparted. Today, we will be doing park and street evangelism. May God direct us to divine appointments and open many doors of opportunity for His good news of the gospel. May Jesus Christ be glorified. God saves - that's what He does! Sorry, one more story for the day because God is amazing and we just can't help but tell you about it. The young man with John Herr in the photo is named Usman. Two years ago, this young man was one of the customers John served at the eye glass clinic here in Sunnyside. John shared the gospel with Usman and he not only gave his heart to Christ but he was baptized soon after. This year, he has come back to serve at the conference even though he lives in Cape Town now. Usman went out of his way to find John this morning at church in order to thank John for sharing the truth of our Jesus with him. The second picture is of Usman helping with all the conference needs. God saves and then God sends. Usman declared that he is sharing the love of Jesus with others now. Amen and amen. Encouragement from our Father who is rich in lovingkindness. It was a brilliant Day of the Lord! Our amazing Pastor Keith imparted the word to an eager crowd at Hope Baptist while Dave McKee rightly divided the word of truth to the congregation at Shoshunguve (which required the use of a translator since some didn't speak English). Both men were used mightily of the Lord and we are so thankful for them. See pictures below. We spent the afternoon sorting sunglasses, dresses, bibles and other donations we carried here from you all back home Thank you for these tangible evidences of God's deep love and care for the people of Pretoria. Of course, we had to snap the obligatory silly sunglasses shot. Yes, that really is John Herr in the pink Minecraft glasses (Ron Goodnight is sporting the orange and Dave the green minecraft glasses). Finally, I have included a favorite shot of two little girls who insisted on sitting by me at church this morning. They literally took my bible off my lap and bent over it trying to make out the words and follow the story of Jonah. It reminded me, again, of the sacred gift that God's word is to us - one that I must never ever take for granted. Please pray these sweet ones would crave the food of God's word all the days of their life. Pray for all the little ones of this Shoshunguve congregation who live in such poverty. May they seek and find this Jesus who loves them beyond measure. Pray for us as we begin the Christian Community Development Conference tomorrow. Pray for each one on our team who is slotted to teach a plenary or workshop (or both!). We long for wisdom and peace, but above all else to be used by Jesus to draw hearts to His. This is the cry of our hearts, that He and He alone would be glorified and that His kingdom would be exponentially expanded to His ever lasting glory. Amen and amen. What a glorious day God gave us yesterday as we re-established some long time friendships and met new brothers and sisters in Christ! God is good, all the time. We give thanks to the God and Father of our Lord Jesus Christ as He has blessed us with every spiritual blessing in the heavenly places. We look with eager anticipation for what He has ordained for us this day. Pastor Keith will be preaching at Hope Baptist Church this morning and Dave McKee will be preaching out at Shoshunguve. Please pray an anointing of the Lord over both of them, asking God to speak directly into hearts through their obedience to His call. We give thanks to God that He calls us to obediently minister the word but the results are entirely up to Him. Who better to transform hearts than the Author Himself? Pray for us as we take to the streets and invite the multitudes to come and hear about our Jesus today and in the coming week. Your prayers are the undergirding of any kingdom work here and we are humbled by them. Pray for the faithful staff of Hope and Shosunguve as they daily minister to the needs of their communities. Pastors Julius and Cintia send their warmest greetings and thank you for your faithful prayers. Keep on kneeling before our Father on their behalf. Ok, well, it's really just the 2017 South African team but that tag line sounded more official. Here is our home away from home for the next few days. Please pray that our internal clocks adjust quickly and we are as useful as God purposes with great joy and wonder. Thank you for praying us safely here. Flights were timely and smooth; connections were easy and now we are setting our sights on praying around the capitol. Your prayers are a gift that keeps on giving. Thank you and please continue. Another Journey from AZ to SA! Today, our SEVENTH South Africa Mission Team is departing to go “on mission” Sept 21-Oct 1 2017, for evangelism, eyeglass distribution plus leading a conference alongside the team at Hope Baptist Church in Pretoria! This year's team from FSBCS includes Ron Goodnight, John Herr, Dave & Nicki McKee, Mona McDonald, Don & Sharon Lovell and Keith Matney. Also joining the trip are Steve & Beth Shook from Foothills SBC Ahwatukee and Tracy Newcomb & Becky Nance from Foothills SBC Yuma. Watch this blog for updates and reports throughout their trip.